Ted MacCormac told us about a very interesting fundraising that a club he attends in Hawaii did one day. Members were invited to donate the spare change they were carrying. They ended up raising a considerable amount, but the most impressive part was that the venue's server was one of the largest donors! 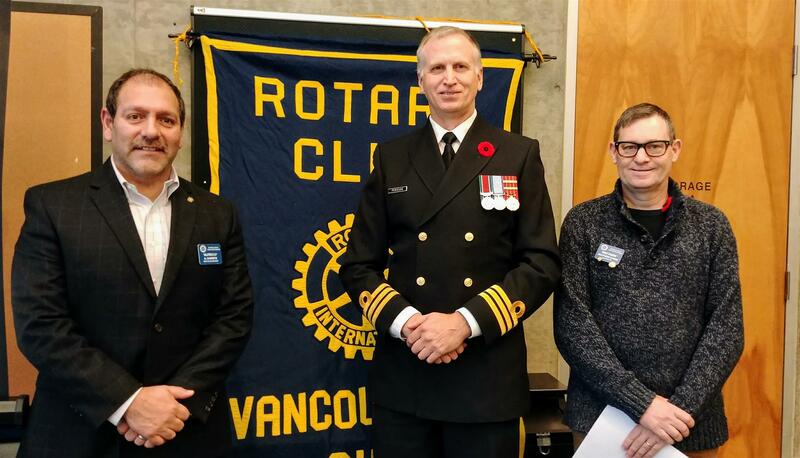 Our guest speaker today was Commander Chris Persson, Commander of the HMCS Discovery. HMCS Discovery is a Royal Canadian Navy Reserve division and shore facility based in Vancouver, British Columbia. Created during World War II from the Vancouver Half Company of the Royal Naval Canadian Volunteer Reserve, Discovery was used for recruitment and training and provided almost 8,000 personnel during the war. Discovery continued in its training role following the war, and also serves as headquarters for several Reserve and Cadet units. Commander Chris Persson joined the Naval Reserve in Ottawa in 1978. For the first 8 years of his naval career he trained and worked as a cook, working in that capacity on and off on the west coast and in some of the nation’s smaller naval ships. In July 2011 he deployed on a six-month tour in Manama, Bahrain where he was a Future Operations planner for Counter Piracy and Counter Terrorism Naval Forces in the Indian Ocean and Somalia Regions.